In a world gone wild with self-promotion, Dr. Boris Mouzykantskii does not have a Wikipedia page and barely registers in a routine search. Yet ad tech majordomo Terence Kawaja of LUMA Partners calls him “the Godfather,” saying “much of the industry tech can be traced back to his work” — his intricately constructed code modules can be found lurking within the foundations of a contractually undisclosed majority of the most important buy- and sell-side platforms in ad tech. Mouzykantskii is a Russian-born theoretical physicist and the Founder, CEO and Chief Scientist of IPONWEB — which won’t help most of you. 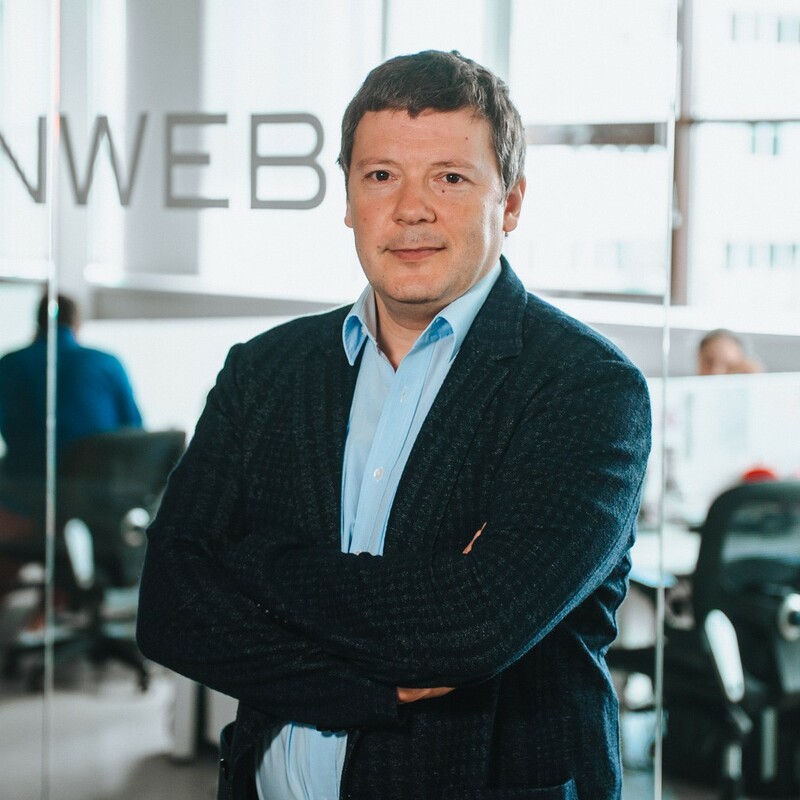 IPONWEB itself, headquartered in London and with offices in Moscow, Berlin, Manhattan and probably points in hyperspace – is as shrouded as its CEO in technicality. Basically, it provides and customizes components for other companies that support programmatic advertising. Like Larry David in the days before Seinfeld, Dr. Boris is more respected than known. After a period of pursuit, I am lucky enough to meet the cryptogram in person. It’s a warm October day in IPONWEB’s sixth-floor office on West 24th Street. We’re within sight of Madison Square Park, where so many of the early episodes of ad tech occurred. Mouzykantskii is an affable and thoughtful fellow, drawn to fitting technical movements into the grand march of time. Which is why we start out rather philosophically. DOES ADVERTISING HAVE ANY VALUE? Yes it does. It’s easy to make almost anything now. In the past — something like the steam engine — it took a lot to build it. And if you created it, the supply was so much less than the demand that you would sell it out [without advertising]. Today, you can make almost anything efficiently. But nobody needs a lot of these things. There’s no demand. The real work comes in trying to convince people to buy it. Ninety percent of people’s job now is advertising — convincing people to buy what the other 10% makes. It’s like advertising is the only job there is. SO HOW CAN A COMPANY WIN TODAY? There is an advantage in what we call Big Data [which, elsewhere, he has called “a rebranding of ‘normal’ data”]. Google was the first example of the advantage of a large volume of data to a business. It’s different from network effects — there you need something to trade. And different from a traditional monopoly. Basically [Google] just knows more, and they use this data to improve the product, which brings more users …. The data itself is the unfair advantage. So even if you come up with an algorithm that’s four times more powerful, it doesn’t matter because you can’t overcome the data advantage. It’s the same with Amazon. And Facebook. Not with Netflix so much — it’s a different vertical. There the creative product [itself] seems to have some value; it’s not the same as search. But the personal information that Amazon knows is extremely valuable, and it can’t be competed with really. I think consumers don’t really understand what is going on yet. Mouzykantskii and his wife Natalia started IPONWEB in London in 2000. Originally, it was a tool for attorneys to search and track patent filings (the “IP” stands for intellectual property). It proved frustrating, yielding one client. Meanwhile, a cadre of ad-focused dreamers in New York were building their own I.P. at Right Media. HOW DID YOU GET INTO THE AD BUSINESS IN THE FIRST PLACE? It was basically by accident. I was a teacher at the University of Warwick, what they call a Senior Lecturer, supervising Ph.D. students in theoretical physics. We [also] had this business [IPONWEB] that my wife basically ran. At this point, Right Media didn’t have their own tech. They were reselling media [mostly] from AOL …. And they decided to build their own ad server. Brian [O’Kelley, now CEO of AppNexus] was basically writing the code by himself. There was a deadline; it must have been Q4. He realized he had time to write the code but no time to test it. So he posted a job on a job site, and I responded. For the first year or so, I didn’t even meet him in person. HOW DID YOUR RELATIONSHIP WITH RIGHT MEDIA DEVELOP? We started [testing] pretty much with a black box. Then Brian said it could be faster if we read the code, and we started working on it. As I understand it, Brian used to join the [Right Media] business meetings, at a high level, and promise certain things to clients. Then he’d write the code from midnight to three in the morning New York time. Now it’s morning in Moscow. He’d send it to us to check the code with these short emails — three lines. And we would debate what it was he wanted it to do. We’d respond with another email and this long list of questions, which wasn’t what he was expecting. So he was always more or less upset with us. But he kept giving us work, so I guess he must have liked what we were doing. Over time, Mouzykantskii and his team got more involved with writing code as well as testing it. His precise contribution is difficult to disentangle from the mashup, and he is one of three inventors named in a key patent. Staffers recall him as a genial, brilliant figure, in and out of the Silicon Alley offices, willing to explain the contours of the platform’s algorithms to the sales and product teams. WHAT WAS ACTUALLY BEING BUILT AT RIGHT MEDIA? At the time, there were really no products for [ad] networks. There were just ad servers, like DFP and DFA [i.e., DoubleClick, acquired by Google in 2008]. Right Media was a platform for networks. The idea was to get as many networks as possible to join and to enable trading across and among them. This was the first big lift in complexity. The first time a second network joined and traded with another network, there was an immediate jump in volume. I think it was at least 2X. The market didn’t have a good ‘network engine.’ We helped Right Media build that engine. WHAT WAS THE MOST DIFFICULT PIECE TO BUILD? Well, plugging networks into the engine was relatively easy, connecting them. The complexity came when [Right Media] enabled trading across the networks. We needed a demand subsystem that could operate in an environment where there were different types of deals. It had to be able to convert one type of deal into another type. Brian had coded a basic predictor, and in 2006 he figured we could do a better one. It would work for a CPA-type business model overall and used a tree-like structure. By different “types of deals,” Mouzykantskii means CPM, CPC, CPA — the basic currencies of digital ads, then and now. O’Kelley’s system translated these into a universal effective CPM or eCPM, which required him to predict click rates based on probabilities. WHAT WERE THE ALGORITHMS THAT RIGHT MEDIA USED? There were two main algorithms we developed. The first was something called Predict — this was the prediction trees. It didn’t do structural discovery, which I suppose we weren’t smart enough to do at the time. The structure of the trees stays the same [in the algorithm]. The second algorithm was for budgeting and pacing, to determine how to spend the media budget. By 2006-07, a triumvirate of Microsoft, Google and Yahoo vied for market control. DoubleClick was the leading ad server, and the topic of a storied seduction. Each major player ended up with an acquisition; Right Media went to Yahoo. Despite rumors, Mouzykantskii says all his code was “work for hire” and went to Yahoo in the deal, although his own status vis-a-vis Yahoo full-timing was left pending. Eventually, IPONWEB contracted with Yahoo for three years, during which Dr. B and his team of 50 engineers focused on building out their early lead in real-time bidding systems. IPONWEB continued — and continues today – to focus on modular elements that can be customized into ad tech platforms. More rumors put the company’s elements at the core of most of the extant demand- and supply-side platforms and exchanges, but few are named. IPONWEB’s business model is modestly to white label and adapt foundational ad tech for hire or license. LOOKING BACK, WHAT IS THE LEGACY OF THAT TIME? For one thing, Right Media was a great business development tool. We got a lot of gigs out of people who left and started other companies …. Yahoo at the time wasn’t very good at retaining talent, either on the tech or the business side. This was the moment that RTB was exploding …. [Recently] I looked through a list of all the companies that had given us at least $1 and it was 150 ad tech companies. That’s a lot. The way it worked was they would call us in the early stages. We didn’t want to write the same code over and over again, so we created products that we’d license to them. A lot of times this [licensing] didn’t fit into their startup story, so they moved on. But there’s a lot of companies that used us. For more on IPONWEB, see its site. This story is part of my ongoing series on the pioneers of ad tech. Read more about them here and here.